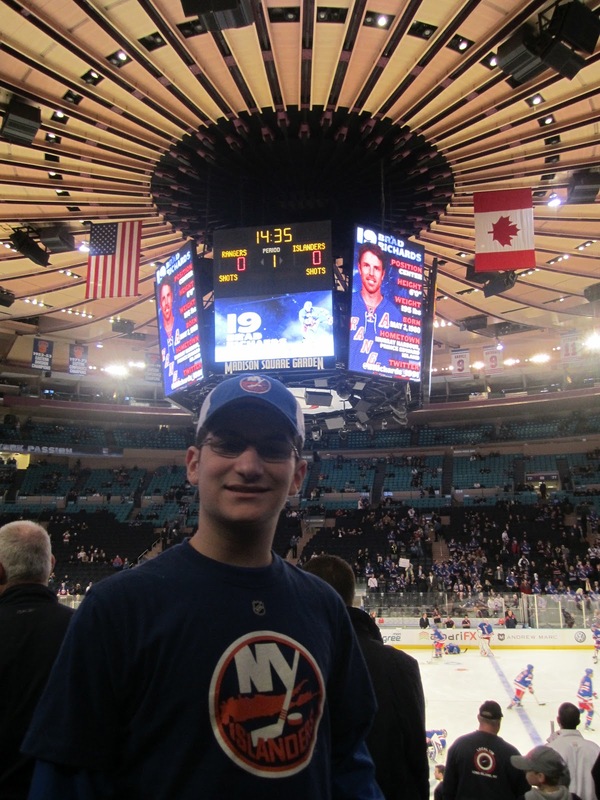 On December 26, for the first time in my life, I attended an NHL game that was NOT played at Nassau Coliseum. 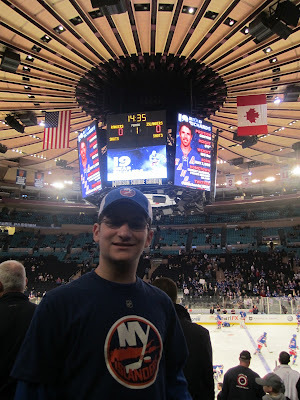 I went to Madison Square Garden to see the Rangers host the Islanders. At every game I go to, I wear my blue Isles home jersey. But this time, for fear of it getting ruined, I chose to wear my "Haley 59" shirt that I bought at the end of last season. I figured that MSG would be a cruel environment for an Islander fan. I was waiting to be booed, yelled at, and I was half-expecting to get a beer dumped on me. Walking into the Garden gave me a whole new perspective on hockey arenas. I had seats in the lower level, which was renovated over this past summer. The concourse was huge, there was a nice, clean, and shiny floor, as well as large well cushioned seats. The ushers were wearing suits and ties, unlike at the Coliseum where they wear sweater vests with Isles logos on them. When I got to my seat, I could hear the guy sitting next to me mumble under his breath. "Great, we're sitting next to Islander fans." As the warmups began, the seats began to fill up. On Long Island, the seats are usually full at the bottom, but nobody is at the top during warm-ups. After warm-ups, I had a waitress bring me food directly to my seat. Too bad they don't have that on Long Island. If your are wondering, everyone in the picture on the left is looking at PA Parenteau (off-camera), who has the puck. I guess the Isles are thinking if the goalie can stop 9 Islanders, he can stop 5 Rangers. Only problem, there is only 1 puck each time, and the Rangers are deadly accurate. Suprisingly, the insults stopped there. After the first period, I was throughly satisfied witht the Isles effort. It was scoreless and Evgeni Nabokov was great. Unfortunately for the Isles, Henrik Lundqvist was also great. Less than 5 minutes in the game, Micheal Haley got into a fight, and had to leave due to an injury sustained in the fight. He had to take the "skate of shame" to the locker room after he had already sat in the penalty box. As we all know, the Rangers went on to win the game 3-0. Rookie Carl Hagelin had a pair of goals and Marian Gaborik added a late empty net goal. This scene to the left shows the general hoopla after the puck crossed the goal line. You can't blame the loss on Nabokov, he played great. You can blame the loss on a lack of execution by the Islanders. They tried to make the fancy play instead of just shooting the puck. Henrik Lundqvist stood on his head for the Rangers, making 28 saves for the shutout. The facts are the Rangers are a very good hockey team. This could be their year. The Islanders are still searching for an identity. The fans at the Garden realized that any insult they yell at me can't do enough justice. Simply looking at the scoreboard will do enough justice and makes more of an insult. Take a look at the scoreboard for yourself, and tell me that isn't an insult for Islanders fans. Like I said, the Isles need to find an identity. If nothing shows up, we will be in for another long season. Thanks for reading. That's all I have from MSG. When the puck slowly slid across the goal line at the Prudential Center last Saturday afternoon, I can assure you that I was not the only Islander fan ready to give up on this team. In my mind, and out loud, I was screaming, "What do they have to do to get a win?" As I was in the process of typing a tweet about how bad the Islanders are, the MSG+ crew was showing replays of the goal. I calmed down enough to watch the replays, and after THIS decision was made, a faceoff was irrelevant, and the Islanders somehow had came away with 2 points and their first road win of the year. They can keep it rolling. After that mini heart attack, the Islanders played a great all around day to close out November on a positive note. In Bufflo, Brian Rolston got the late backhander into the back of the net. Al Montoya was phenominal, making 30 saves and getting another win. A few points from these games. 1. Michael Grabner needs a breakaway coach, or to think less. 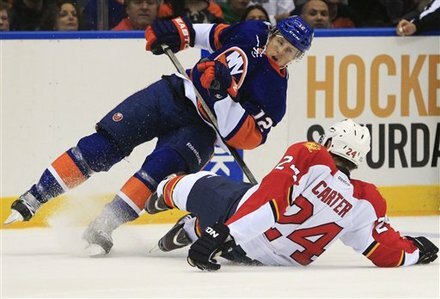 In the last 3 games, Grabner has had almost 10 breakaways and a penalty shot. He only converted on one, and that was the one when he had no time to think about where he was going to shoot it. 2. David Ullstrom is really playing well. He is getting opportunites, and he is helping the team convert. He got an assist on the game winning goal yesterday, and he is playing like he wants to stay in the NHL. 3. Al Montoya is trying to end the Islanders goalie controversy. Last night, he was unbelievable in Buffalo, and he has played great. He is the #1 goalie. 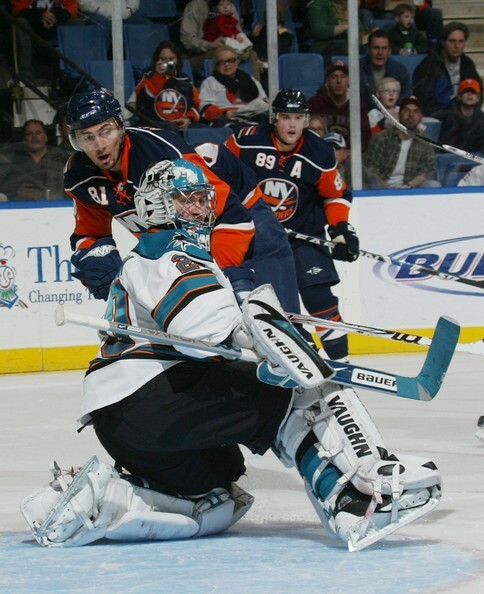 Rick DiPietro can wait, and whenever Evgeni Nabokov gets back, he should be traded. A two game winning streak to end November is nice, but it will take a lot more to put the Isles back into playoff contention. Back to back games in Chicago and Dallas should be a real test for this club. Time to put up or shut up. On Long Island, things are changing. Rapidly. Let's rewind to about a week ago, Monday November 14th. On November 14, the Islanders had just gotten back after a long flight from Vancouver following a 4-1 loss. Al Montoya, Rick DiPietro, and Evgeni Nabokov were all healthy. 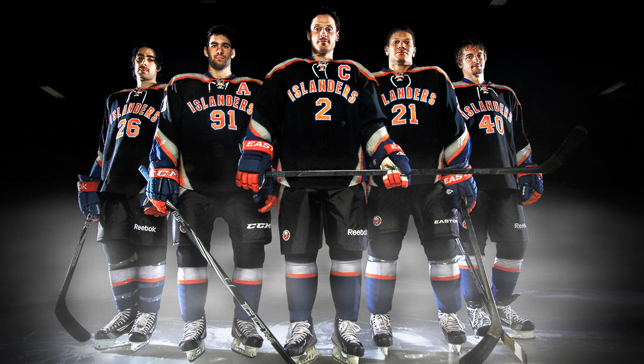 Lastly, every Isles game jersey has had either blue, orange, or white as the main color. Oh, how things can change in 6 days. On Tuesday, the Rangers came into the Coliseum and thanks to a late flub by Josh Bailey, got a tie-breaking goal and left with a 4-2 win. This picture pretty much sums it up. The Coliseum was packed with Ranger fans. And after the goal, you can see the presence of all the Rangers fans going nuts. The Rangers players are thrilled. Evgeni Nabokov did everything he could do, but the Isles couldn't do anything in front of him. On Wednesday, the Isles did something nobody ever would have expected. They unveiled a new, black jersey in a fashion show event at the Coliseum. 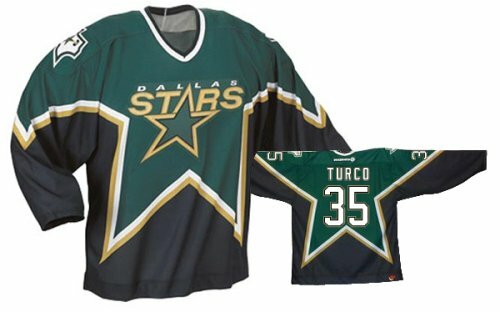 My take on these jerseys is that they could be a lot worse, but I don't like them. Just my opinion. View them for yourself and decide whether or not you like them. 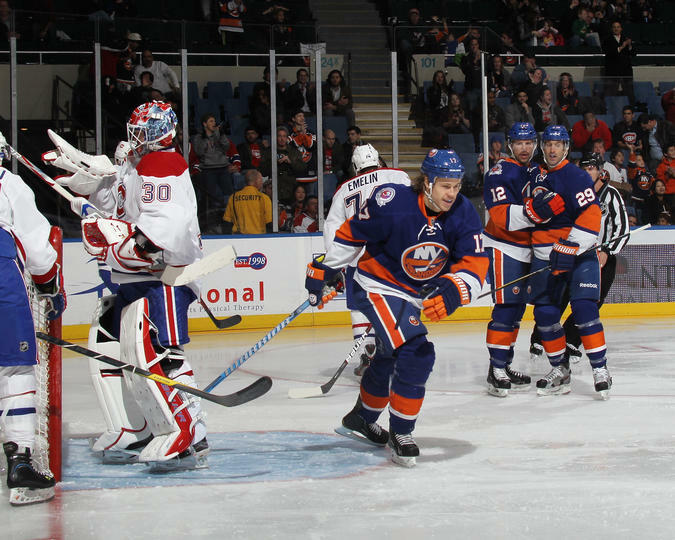 The following day, the Isles just held on long enough to squeak out a 4-3 win over the Canadiens. Jay Pandolfo notched his first goal as an Islander and his 100th career goal. Evgeni Nabokov started the game. But in the first period, Nabokov hurt his groin while saving a shot. He was placed on injured reserve the next day. He's out for about a month. 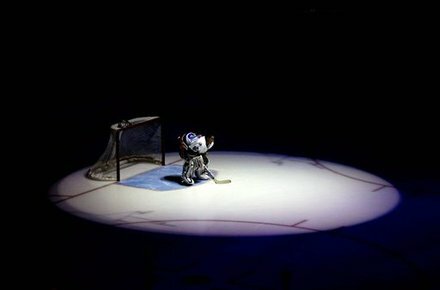 He was playing like the #1 goalie, but we all know how these things work out with the Islanders. In theory, this solved the Isles 3 goaie situation. DiPietro and Montoya would play while Nabokov healed. 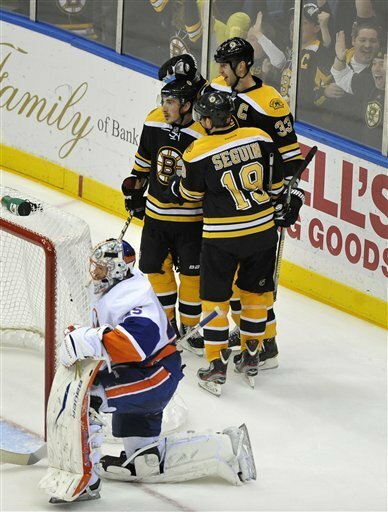 Yesterday, the Islanders were at home hosting the defending Stanley Cup Champion Bruins. But before the game, the Isles did a suprising move and called up rookie Anders Nilsson, who had no previous NHL experience, from Bridgeport because Al Montoya had a hamstring injury. After the Bruins clobbered both DiPietro and Nilsson throughly, the Isles were left battered and bruised. So, here we are. The Isles are already on their 4th goalie. 2 are on IR, DiPietro is the HEALTHY one, and if things go wrong from here, the Islanders also have Kevin Poulin in Bridgeport, you may remember him from last year. He played great before having his season shut down due to an injury. The Sound Tigers also have former Ranger Steve Valiquette because they needed a goalie after Nilsson was called up. I wouldn't be suprised if the old former Ranger is in the Isles crest real soon. I'm sure you all know what is going on right now. Let's just hope this is not turning into last season. I'll just leave it at that. Right now, I'm going to break away from my normal blog entries and focus on a story that came back to me earlier about my first Isles game. "Welcome to the game." An usher greeted me, handed me my ticket, and I was standing inside Nassau Veterans Memorial Coliseum for the first time. It was October 28, 2001 and my father and I were going to an Islanders game, my first one ever. Since I was only 7 years old, I didn't really have much of an idea of what hockey was or who the Islanders were. It was the beginning of what would become a life-long passion. After an usher showed my father and I our seats, I sat down and got my first glimpse of the Coliseum ice. For a 7 year old kid, that sight was pretty mesmerizing. When warm-ups began I sat in my seat fixated on the team wearing the cool green jerseys. Not knowing any better, I thought those guys were the good guys. Later on, when they entered the ice for the game, I started cheering. Only then my father told me I was rooting for the Islanders opponent, the Dallas Stars. (They do have a good jersey though.) Then, my father explained to me that the team in white jerseys was the good guys, they were the New York Islanders. (Plain, traditional jerseys, I personally like the new ones.) 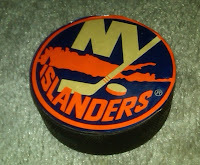 From then, I was an Islander fan. Most of the game is a blur to me, but I do remember some of it. I remember that when the Islanders scored, a loud annoying horn blasted and everyone in the stadium went crazy. I remember being annoyed by the horn, and I also remember at my next game a few months later, I knew the words to the song perfectly. On my way out, an usher, who must have been told by my dad that it was my first game, handed me a puck. Now looking at it, it is nothing more than a blank black puck with an Islanders logo sticker on it, as you can see. It was a great souvenir to end a great day. That day was nearly a decade ago, and that season was a big year for the Islanders. They made the playoffs for the first time in a while. In the playoffs Shawn Bates delivered one of the most famous moments in Isles history. 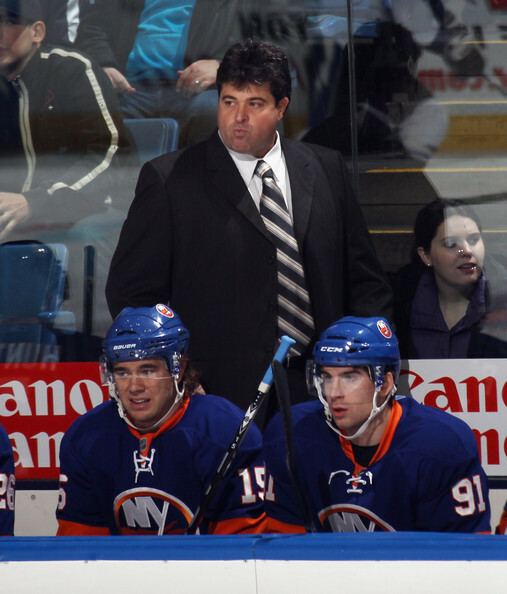 Everyone on that team no longer plays for the Islanders, and current GM Garth Snow was sitting on the bench watching. Now, a decade later the Isles are facing an uncertain future, but one think is for sure, there will be hockey RIGHT NOW on the Island at the Coliseum. Let's go win one for the team a decade ago that just couldn't. If you have been watching the Isles rookie game tonight against the Bruins rookies on the Islanders website, you probably noticed 2 things. 1. There is a new logo on center ice. Not just the same Islanders logo that's always been there, but a newer logo to commemorate 40 years of Islanders hockey, similar to the logo seen below, which will also be a patch on the Islanders jerseys this season. 2. Rhett Rakhshani, who appeared in a couple games for the Isles last season, left the game with a concussion and will be re-evaluated tomorrow. Let's hope he is fine, and doesn't have setbacks like superstar Sidney Crosby. Get better Rhett, the Isles may need you soon. Alright, August 1 has passed, and we all know what happened. But what happens now? If you are an Islander fan, what should you be looking forward to? As owner Garth Snow has said, the new arena dilemma now will not be the top priority for him and for most of the Islanders staff. Their new priority is on this upcoming year, and the future for the hockey season has never looked brighter than it does right now. Let's put the facts out there. 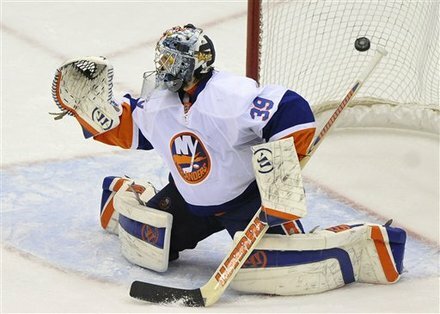 Infamous goalie Evgeni Nabokov says he WILL report to Islanders training camp in September. This said, he will have a chance to compete for a job with the Isles, although Rick DiPietro (contract for life) and Al Montoya (great job last year) look to have the spots on the Isles locked up. This means that he could be worth more in the trade market than as a goalie. Whichever way this goes, the Isles should improve because of it. The Islanders improved their power-play by trading for veteran forward Brian Rolston. He has one heck of a slap-shot, and he should be ready to unload it. Brian also can provide some veteran leadership to one of the youngest clubs in the NHL. After missing all of last year due to a fluke injury in a inter-squad game, veteran defenseman Mark Streit is coming back. We all know what he can do, and hopefully he can be a leader on and off the ice. In my mind, Mark Streit is the next captain of the New York Islanders. I don't know what to make of these, but if the Isles win while wearing then, so what? Training camp is around the corner, and you can't have a good season without a good training camp. Let's see how this all plays out, and for now let's focus on what happens on the ice. Time for now full time head coach Jack Capuano to make some tough decisions. This line was together for most of this past season, and they produced. Tavares, Moulson, and Parenteau were first, second, and third, respectably, in scoring for the Isles this past season. Taking apart this line would be a shame, as JT is primed to be one of the NHL's top scorers. This line could be together for years to come. Ever since Kyle Okposo returned to the lineup, this line was formed and they stayed together for the rest of the year. This line flat out has everything. Frans Nielsen could be a future Selke Trophy, which goes to the best defensive forward in the league. Also, you can't forget about Nielsen's unstoppable penalty shot. Michael Grabner came out of nowhere to become the NHL's fastest skater at the All-Star game. He also scored a team leading 34 goals and seemed to get a breakaway a game. 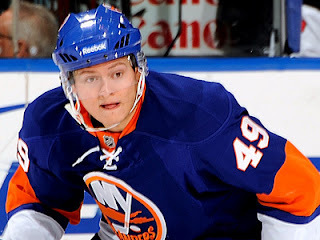 Then there is the man who I think is going to wear the "C" on his jersey next year, Kyle Okposo. This line is a great line and, if together, will produce. Now things start to get interesting. This line is up in the air. But it is a great scoring line. This season, Comeau and Bailey emerged as great scorers, with Comeau scoring 24 goals and Bailey getting 17 assists. This line also has a man who has played with the Islanders for the past TEN years, Trent Hunter. when he's healthy, Trent is a big physical presence and he has a great slap-shot. I really would like to see these guys on a line, it would be exciting for everyone. This 4th line is up for grabs. But, the line that I have chosen is a good one. First off, you have the fighting ability of all three of these guys. Then you have the offensive skill of all three of them. They may not be prominent goal scorers, but they get their chances. Haley is coming off a short stint with the Isles at the end of the season, and he became a fan favorite within about 3 hours of being called up because of his fight against Penguins goalie Brent Johnson. Gillies is and has always been a fan favorite, and the Islanders love him, so he will probably be staying. Matt Martin also had a solid rookie season, impressing Isles fans. Now, if you have been clicking on the player's names in this entry, you may have noticed that the highlights are all goals, except for Radek Martinek. He's been an Islander for the past decade, and yet John Tavares scored more goals this season than Martinek scored in his whole career. When Martinek gets the chance to shoot, he lets off a great shot, but his known for his great defensive and physical play. On the other hand, there is Mark Streit. He missed all of last season after a collision with Matt Moulson during the team's inter squad game. When he returns, he will be in charge of the power-play, and he can shoot. In his first year as an Islander, 08-09, he led the team in points with 56. He is the Islanders top defenseman, and if he is healthy, watch out. At the start of last season, Travis Hamonic was in Bridgeport and Andy MacDonald was going to be the #2 defenseman. However, things change fast, and after the Islanders traded James Wisniewski, these two men were the Islanders top defensemen. They were phenomenal and proved that they deserved to be the top pair. Next year, I hope they stay together in the NHL, even though they won't be the top pair. Hamonic looked like a seasoned veteran at points last year, maturing very quickly. All of this while MacDonald showed why the Isles have stuck with him until this point. These guys need to stay together. This third defenseman pear is also up in the air, but these two people deserve to be on the team. Mark Eaton is a great defensive defenseman and playoff veteran, and his name is on the Stanley Cup from his year with Penguins a few years ago. Mark is also a great leader, and he had the "A" on his jersey for a little while before he got injured to prove it. On the other hand, Milan Jurcina has one heck of a shot. At the Islanders skills competition before the season started, it was clocked at over 100 miles per hour. He also can make great checks, like you see in the videos above. He should be on the team in October. This does leave a few questions. Whether or not you like it, Rick DiPieto will be on the Isles active roster next year. Al Montoya, who the Islanders recently signed to an extension, will also be back. Who will start most of the time? That is a great question. You may have questions, but I have compiled a list of the questions that this team needs to think about for next season. What is going to happen to stuck up goalie Evgeni Nabokov? Trade him? Will he show up? 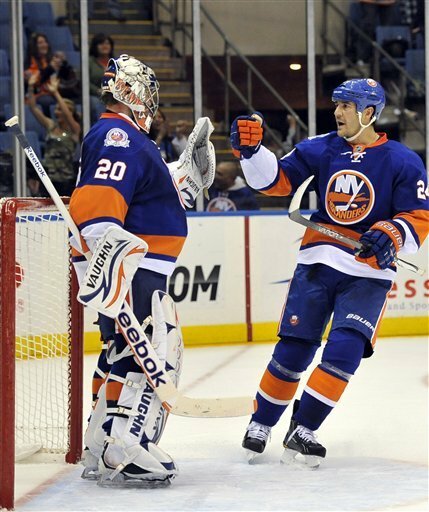 Will Zenon Konopka be an Islander in a few months? Who are the Islanders going to draft? Where is Jesse Joensuu on this list? What about the other defensemen, like Bruno Gervais, Mike Mottau, and Jack Hillen? Alright, there are my predicted 2011-2012 Line Combinations. I hope you enjoy them. Have a great summer, and vote yes for the new arena on August 1. Watching the NHL playoffs is always exciting. If your team is playing, it only increases the intensity. When your team isn't playing, watching the hockey playoffs seems like watching a multi-act Broadway show at some points. The drama, intensity, excitement, and thrill all seem to increase because as many athletes have said before, "The playoffs are when the real season starts." The first round of this year's playoffs have been spectacular, unless your team has been eliminated. Game 7's, many overtimes, and great goals have been the story. There has been one team that has stood out to me the most so far, and it is the Tampa Bay Lightning. You are probably thinking, "Why Tampa Bay?" 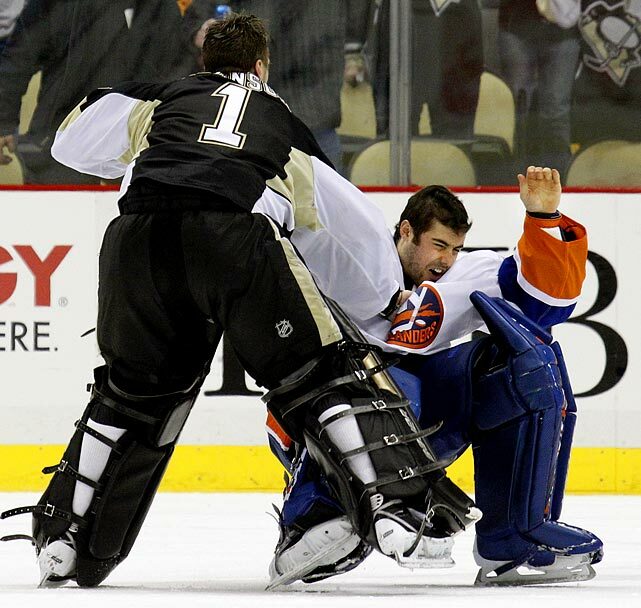 Well, first of all they came back from a 3-1 deficit to the Penguins, winning 3 in a row, including a game 7 epic in Pittsburgh, in which their goalie, former Islander Dwayne "Rollie the Goalie" Roloson, stopped every shot faced and another former Islander, Sean Bergenheim got the only goal, which you can see below. Roloson's biggest save came when another former Islander, Nate Thompson, was sitting in the penalty box for a late penalty. Remember Dwayne Roloson? The Islanders had him for all of last season and for most of this season until a New Year's day trade to the Lightning for D-Man Ty Wishart. With all due respect to Wishart, I think Tampa Bay got the better end of that trade. 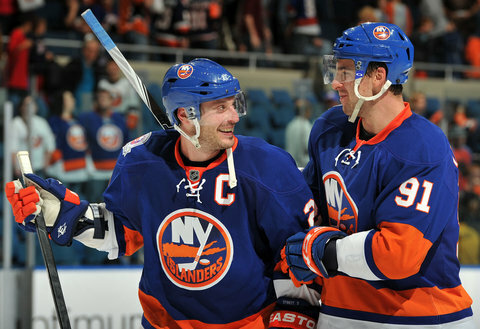 This seems to be so typical of former Islanders, leave LI and succeed, just ask these guys. 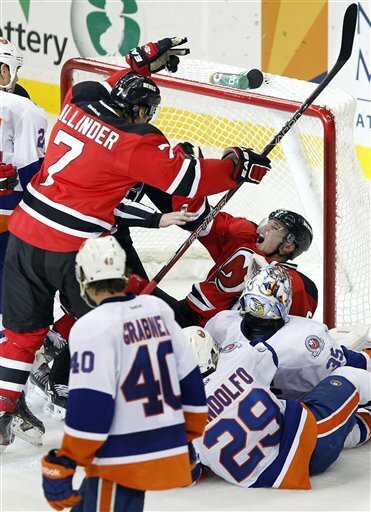 Best of Luck to Rollie the Goalie and the rest of the former Islanders in this year's playoffs. Congrats to the Lightning on their epic win. Keep enjoying the game everyone. No matter what anyone says, the Islanders are Long Island's team, and they always will be. With all of the rumors out there that the Islanders may be relocating, the team is still here in Nassau, for now. And this all fits into "The Script." Since the Islanders lease at Nassau Coliseum expires after the 2014-2015 season, and the Islanders are improving overall, Nassau County executives and Charles Wang are going to have a tough decision to make in the future. To keep a hopefully winning team where it belongs? or explore other options? Let's hope that we can get to that point. 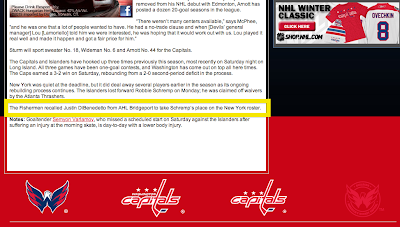 Reading the capitals website's preview about last night's game got me sick. See for yourself and then you will know what I mean. C'mon man. The Isles have not worn a fisherman logo for about 15 years now. Hopefully we will never have to see it again, ever. The Caps need to get with the program.